The world number one was handed another tough first-round match and fell at the hands of the Estonian. 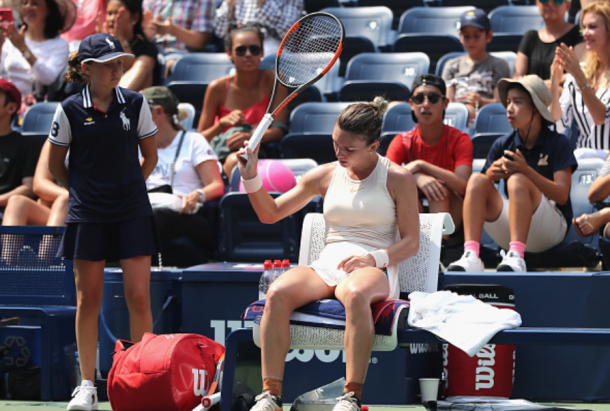 Simona Halep came into the US Open this year having finally won a Grand Slam and in scintillating form after winning in Montreal and reaching the final in Cincinnati. All the talk with Halep was a potential fourth-round showdown with Serena Williams, and the fact she could add on to her lead as world number one after having lost in the first round last year to Maria Sharapova. Kaia Kanepi had other plans though, notching her second win against a world number one after taking out Halep 6-2, 6-4. She will face qualifier Jill Teichmann in the next round. In only Halep's second service game did she find herself in trouble. She missed a wide-open backhand down the line in the open court which would've given her a 40-30 lead. Instead, Kanepi had a break point and calmly sent an exquisite lob over Halep's head to get the early break. The Estonian held for a 3-1 lead and continued to apply the pressure on Halep who was hitting more errors than usual in this match, both forced and unforced. An excellent return on the Halep serve left the world number one little to do but to try and guide her backhand into the court, but it floated long as she was behind 1-4 in the opening set. The French Open champion finally held for 2-5 to apply some sort of pressure on the Estonian. Kanepi was cool as you like, hitting three straight winners to close out the opening set 6-2. The Estonian struck early once again, breaking after hitting a forehand return winner down the line to open the set. The power of Kanepi was quite overwhelming someone like Halep who tends to neutralize these types of players well. Kanepi would break once again for a 3-0 lead as she continued to force errors off of the Halep racquet. She gave one of the breaks back at 15 with a double-fault, and she looked like she began to unravel just a bit, hitting three unforced errors as Halep clawed it back to 2-3. The 33-year-old Estonian held for 2-4, but Halep's fighting spirit very much kept her alive. The top seed held for 3-4, and a sloppy game which consisted of four straight unforced errors got Halep back on serve. The top seed held a 40-15 lead in the ninth game but let it slip as Kanepi broke to serve for the match with a timely forehand volley. What could have been a changing point in this match was what turned out to be a missed forehand by Halep. The Romanian hit an inside-out forehand which was called good, but the challenge by Kanepi showed it just missed. Another forced error from Halep ended the match as Kanepi notched a second-ever win against a world number win against a world number one (Wozniacki, Tokyo 2011).